We haven’t really heard yet from Neil the Intern (remember our interns?) 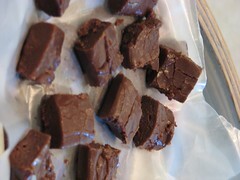 and so please enjoy his debut post; a post on making fudge. Fudge is wonderful. It’s creamy, crystalline, firm, and smooth all at the same time. It’s a treat whenever I eat it, but is especially good when it starts to get cold, and yesterday my father and I made fudge for a post-Thanksgiving treat. Fudge is easy to make, but also easy to mess up. It takes vigilance to get it just right, or else you can end up with a big mess. The most important aspect to good fudge is timing and patience. After getting the mixture to “soft ball” stage (238 degrees), waiting for it to cool to the right temperature without touching it is very tough. If it doesn’t stay still, crystals can form and create something that, while sugary and chocolate, can’t be called fudge (or tasty). 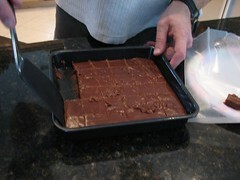 There are many variations of fudge recipes. My girlfriend and I have argued over whose recipe is better (or whether there were even any differences between the two): my father’s, or hers. My father uses the recipe his mother taught him, from the good housekeeping cookbook. Her father uses the recipe his mother taught him, from the corn syrup bottle. But both are very similar and make, in my opinion, estimable fudges. In large saucepan over medium heat, heat sugar and next 3 ingredients to boiling, stirring constantly. Set candy thermometer in place and continue cooking, stirring occasionally, until temperature reaches 238 degrees F or until a small amount of mixture dropped into very cold water forms a soft ball. Remove from heat and place pan in a cold water bath to cool; immediately add butter and margarine or vanilla. Cool mixture, without stirring, to 110 degrees F or until outside of saucepan feels lukewarm to hand. Meanwhile butter 8″x8″ pan. With spoon, beat until mixture becomes thick and begins to lose its gloss. Quickly pour into pan. (Don’t scrape saucepan; mixture on side may be sugary.) Cool in pan; when cold, cut into 32 squares. Makes 32 pieces or about 1 1/4 pounds.